Hargeisa – When migrants are moving in large numbers across international borders, it is immigration officers who are often called upon to act in the interest of humanitarian concern. This is a task for which they are not always fully equipped. 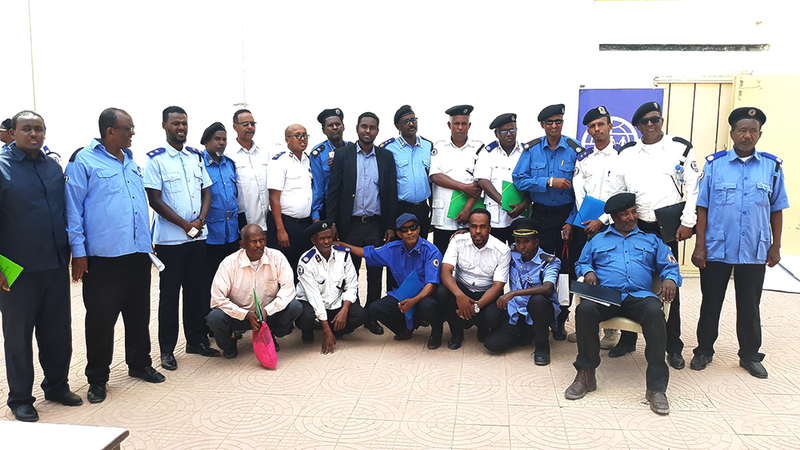 Against this background, the UN Migration Agency IOM on 19-21 February conducted training for 25 Somaliland officers based in Hargeisa and Berbera. The training was part of the Better Migration Management (BMM) programme. This is a regional, multi-year and multi-partner programme funded by the EU Trust Fund for Africa and the German Federal Ministry for Economic Cooperation and Development (BMZ). BMM aims to improve migration management in the Horn of Africa. The three-day training in humanitarian border management and human rights was aimed at providing the officers with the skills they need to understand border agencies’ role in managing migration crisis situations. This included how to prepare, coordinate, respond to as well as how to protect migrants caught in a crisis as they cross national borders. The training emphasized the importance of upholding humane governance at the border during situations of increased pressure. Among the topics covered was understanding the concept of humanitarian border management, the migration crisis operational framework, contingency planning and what steps border agencies needed to take before, during and after a migration crisis. Also covered was an understanding of the responsibilities of the state, the international legal frameworks to apply, including international human rights law, humanitarian law and refugee protocols. The immigration officers were also taught how to identify and how to assist vulnerable migrants, along with how to register undocumented migrants. IOM is one of the main implementing partners alongside UNODC, GIZ, Expertise France, Italian Department of Public Security, CIVIPOL, GIZ and the British Council who are implementing BMM. Apart from Somala, the programme also covers Djibouti, Eritrea, Ethiopia, Kenya, South Sudan, Sudan and Uganda.